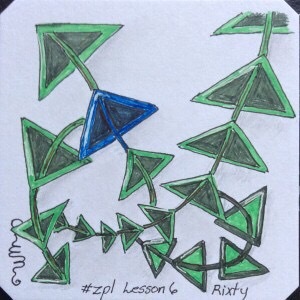 Working along on Lesson 6 in the Zentangle Primer, I drew two tiles of the next pattern, Rixty, and uploaded them to the Zentangle Mosaic app as I finished them. The first was a monotangle to which I decided to add color; the second featured Rixty, but had other tangles included. Rixty isn’t my favorite patterns, but I tried to do a good job just the same, even if I wasn’t concerned about drawing pretty tiles. There is a major flaw in both of these tiles, although the compositions are barely affected. But I know the problem, and so do other tanglers who use Rixty. The problem? The triangles are all upside down! A few weeks ago, I was playing with the inverted triangles and morphing them into shamrocks to see if I could use them that way for a composition. The problem is that the inversion apparently “wrote over” the part of my brain that knew what Rixty is supposed to look like. Today, even though I reviewed the step-out and drew them correctly in a practice sketch, I turned them around again when I drew the tiles and never realized why they felt wrong while I was drawing them. The “wrongness” hit me as I was placing the tiles in my album. Now, a very important tenet of the Zentangle philosophy is that there are no mistakes. If we perceive an error, we should view it as an opportunity to make something new or different. The idea is that there are no do-overs in life–not like a re-take for a TV show or movie–so that all we can do is make the most of what we did by accepting it, creating something new or different, and moving on. In some instances, there is a “fix” that can be applied to mask the problem area, but in most cases we need to use the inadvertent new pattern and use it in some way that lets us finish the work. The “moving on” part doesn’t really relate to my new-styled Rixtys since I wasn’t even aware at the time that I had erred. The error neither stopped me in my tangling tracks nor affected the way I drew the rest of the tangle. In actuality, I created a tangleation of Rixty in the way I drew it. A tangleation is a change to an established pattern that adds something or changes part of the basic pattern concept. Despite the fact that it wasn’t my intent, I made a big change to the construct of Rixty. That others recognize it as Rixty regardless of the triangle orientation may add interest for tanglers who know the basic idea of Rixty. It could very well be that viewers think this was deliberate. And so, the error is not important, and maybe shouldn’t be considered an error at all. 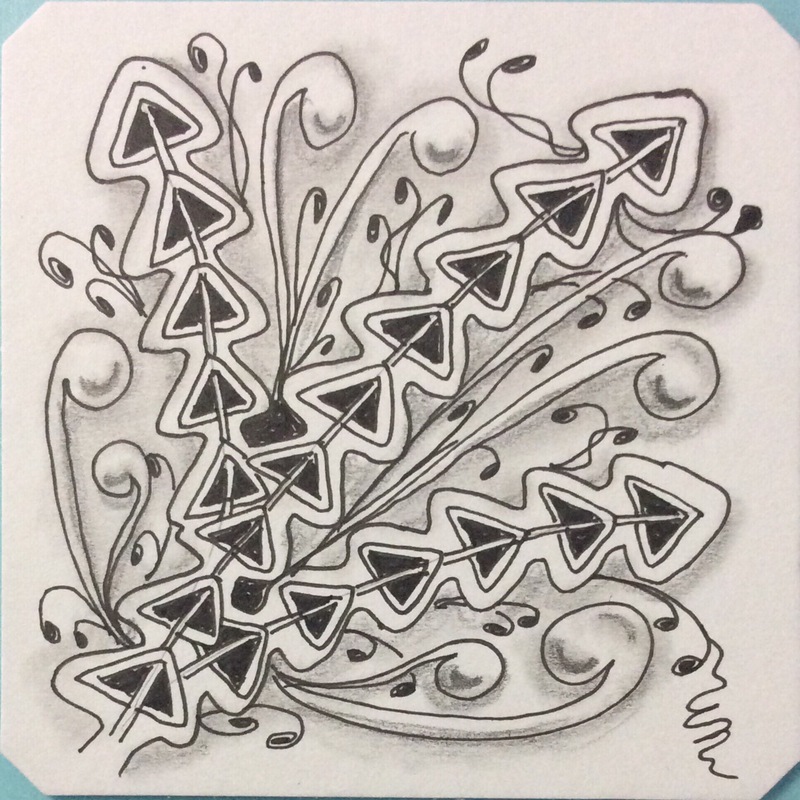 Zentangle is such a forgiving and versatile art form. No wonder it is so relaxing! It is next to impossible to make a mistake! Until next time, Happy Tangling!